You’ve probably heard that turkey contains a lot of tryptophan, which makes you sleepy. It’s true there is tryptophan in turkey, but not more than is contained in most meats. It’s also true that tryptophan is used to make serotonin, a neurotransmitter that makes humans sleepy. The problem with connecting these dots (“I’m sleepy after Thanksgiving” and “Tryptophan makes serotonin, which makes me sleepy”) is that there are also a bunch of other amino acids in turkey. For amino acids to get into your brain, they need to use transporters to cross the barrier. Tryptophan is competing for a ride on the transporter molecules with all of those other amino acids you just stuffed in your face. So why are you sleepy after Thanksgiving dinner? It’s not the turkey, but the extra servings of carbohydrates. Carbohydrates, or sugars, cause your pancreas to release insulin. Insulin helps the body deal with the huge amount of sugar and amino acids you just consumed, but interestingly it has no effect on tryptophan. So other amino acids are taken out of the bloodstream, and tryp-tophan is free to use the transporters to get into your brain, making you sleepy. 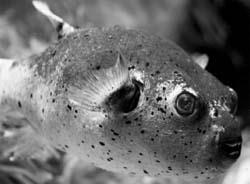 A chemical called tetrodotoxin in the fugu fish can be released into the fish if it is not prepared correctly by a trained chef.